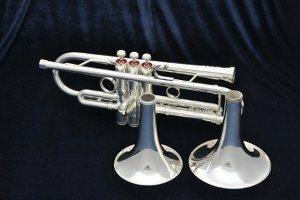 TRUMPET Custom Options | BEST BRASS Corp.
Best Brass trumpets are individually handmade and some custom options are available. These options are innovative and unique, for the kind of flexibility in service only possible from a custom workshop such as Best Brass. 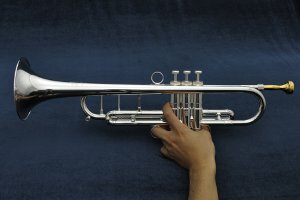 All the options are designed to help you create your own unique special model which can enhance the expressive possibilities of your trumpet playing. The idea for the Interchangable Byll System (I.B.S) came from Shinji’s extensive experience designing French Horns. The same trumpet can use either ‘M’ or ‘L’ bell depending on musical needs. The ‘M’ bell is a standard size (123mm) for all around performance, while the ‘L’ size bell is larger (143mm) for a big powerful commanding sound. Usually tuning slides and triggers can only lower the pitch. But Best Brass’ Dual Direction Trigger allows both higher and lower pitch adjustments. This gives players the ability to make the most subtle adjustments to their intonation, just like a skillful violinist. The Dual Direction Trigger is a dream come true for many trumpeters. Pistol Grip design was created especially for lead players who prefer to hold the trumpet by the bottom part of the valve section. For some this is a comfortable way to hold the horn while screaming out high notes, and it also to allows the body of the trumpet to vibrate more freely. Best Brass’ design permits both 1st and 3rd tuning trigger operations. The grip gives the trumpet a beautiful appearance skillfully blending traditional and modern state-of-the-art design. On Best Brass trumpets, you can change the key using different tuning slides. For example; in order to make a transposition easier you can change a C trumpet to B, or a B♭ to A. 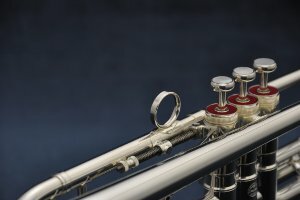 This works well since the HAMANAGA Valve System gives such accurate and centered tuning, the trumpet will play equally well in the other keys. In addition to aiding transposition, it can help you avoid awkward crossed fingerings.